A Note on How to Field Cut Elite Rope Light. The question has come up as to where you can cut the Elite rope light, since there are no marks on the jacket indicating where to do so. Cutting is permitted every three feet, starting where the power cord is attached to the coil. At each cut area, there are two solder points approximately one inch apart from one another. The cut can be made between these solder marks. Attached is a picture that shows what the area should look like. Note that there won't be any lamp leads within this area, so the void should be noticeable. 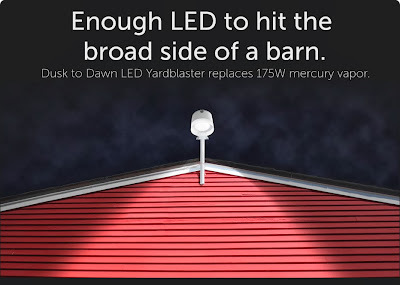 LED Yardblaster from Rab Lighting. YBLED blasts the competition out of the yard. 26 Watts of LED generates a stunning 2689 lumen output, head and shoulders above the competition. making it easy to install in new and retrofit applications. Get a whopping 85% reduction in energy and 96 lm/W when replacing 175W MV. YBLED also replaces 100-150W HPS barn lights, delivering the efficiency you want in LED. Light where you need it. Lots of it. 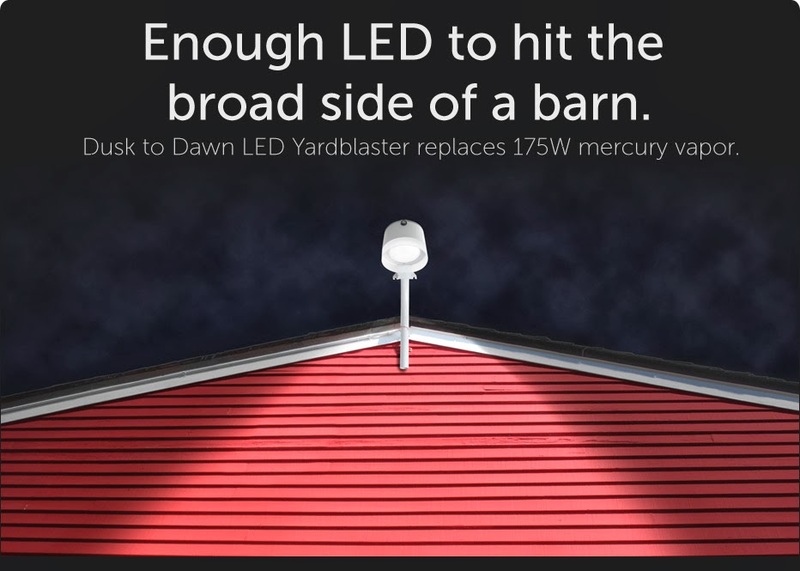 YBLED delivers impressive coverage and widespread light distribution for large yards, barns, docks, entrances, porches and driveways. Available in cool, neutral and warm color temperatures to match your landscaping needs. YBLED has an integrated dusk to dawn photocell for peace-of-mind security and best-in-class energy efficiency. The vandal resistant YBLED will stand up to tough environments in a big way, while keeping a small profile at under 6" in height. NovaT 0-10V Dimmer and PowPak Dimming Module with 0-10V Control Now Available! With the introduction of LED lighting to our industry over the past couple years, we watched a new frontier emerge, a modern day version of the Wild West, if you will. With no standardization on technology, it seems you see marketing for LED lamps everywhere you turn claiming "long life!" and "dimmable!" However, much of the product in the marketplace is unreliable since there are no standards that manufacturers must follow. We are happy to say that this is changing. The larger lighting manufacturers such as Cooper, Lithonia, and Cree are introducing hi-bay or lay-in LED fixtures comparable to the standard fluorescent fixtures standard with 0-10V dimming capability. The question that arises is what controls you use to dim these new 0-10V LED fixtures. Our friends at Lutron Electronics recently released two very exciting product solutions: the 0-10V Nova T wallbox control and the PowPak Dimming Module with 0-10V single room control, which works seamlessly with Lutron's line of Energi Tri-Pak products including Pico controls and Radio Powr Savr wireless occupancy sensors. The NovaT 0-10V wallbox dimmer is rated for 120-277 volt control of 0-10V rated LED drivers or ballasts. You can control loads up to 8 amps without a power pack. The NovaT 0-10V dimmer is considered a small control, which means it installs nicely in a single gang box. It is available in the standard matte finishes, and is coming soon to a Hein Service Center near you. *Please note: The NovaT 0-10V wallbox dimmer is only available in single pole. The PowPak dimming module with 0-10V control allows you to control 0-10V drivers, ballasts, or fixtures, and works seamlessly with the wireless daylight sensors, occupancy sensors, and Pico controls. Perfect for multi-location. Also coming soon to a Hein shelf near you. Both options are cost-effective at only $90 each, and are perfect for use in areas such as classrooms, hallways, warehouses, office spaces, and conference rooms. As always, our Lighting Department is happy to help. adorne Under Cabinet Lighting System - In Stock at Hein Electric Supply! Hein Electric Supply is your source for adorne Undercabinet Lighting Systems. We stock the modular track in 12", 18" and 27" sections with an integral duplex receptacle. Seamlessly add dimming options, a USB plug-in module, and a mobile phone or tablet cradle. The solutions are endless. This system is on display at our Brookfield Service Center. Replace existing incandescent lamps with GE LED lamps in your home or business and start saving today. Hein Electric Supply has a broad selection of LED lamps in stock including A-line for table lamps, BR30 LEDs for downlights, MR16s for track lighting, and PAR lamp LEDs for flood lights. As part of our ongoing commitment to product quality and safety, we want to inform you of a unique set of circumstances that may cause some SureLites Exit Signs not to illuminate. If the signs are installed on a sub circuit serviced by power factor correction capacitors (typically used to reduce heavy inductive loads like rotating motors), then the sign may not function during a power outage. This is a rare combination of events and we are aware of only one instance of this occurring. The affected catalog numbers are LPX7, SLX7, CX7, EXL7 and CHX7 product families that were sold with date codes between February 4, 2010 and August 26, 2013. All AC-only designs and self-powered designs with Eagle Eye self-diagnostics are not affected by this issue. These products would have a "6" or "SD" in the catalog number. For example, LPX6 or SLX7SD would not be affected. All products sold after September 1, 2013 have new designs and are not affected. Eaton's Cooper Lighting makes this announcement voluntarily and with an abundance of caution. If you suspect you have a problem, please call 1-800-954-7228 8 AM to 5 PM EST and we will ship replacement exit emergency fixtures at our cost as well as answer any questions you may have. We appreciate your cooperation in ensuring the integrity of these products. We regret any inconvenience this may cause you and your customers. New Line of Emergency Lighting Products Now In Stock!. We recently added Hubbell's Compass Emergency line of off-the-shelf products to our inventory. Our Brookfield warehouse, along with every Hein Service Center, is fully stocked with a complete assortment of the most popular items. CCRRC - Combo Emergency/Exit with LED heads. One of the smallest combo profiles on the market. Capacity for remote head. CER - LED Exit. Matching profile to the CCRRC. Standard battery operation, no remote capacity. CORD - Dual LED outdoor remote head. Must be used with the CCRRC when providing outdoor path of egress. CU2 - Two headed LED emergency light. Our designs have shown we can space these units out to 18ft on center, equaling that of the Lithonia ELM2, significantly farther than the Philips VU6 (12ft on center). As always, spacing suggestions are to be used as a guide. If your client wishes, we can provide and egress layout showing exact mounting locations. Please contact our Lighting Department and let us know how we can help. CU2 - Two headed LED emergency light. Our designs have shown we can space these units out to 18ft on center, equaling that of the Lithonia ELM2, significantly farther than the Philips VU6 (12ft on center). As always, spacing suggestions are to be used as a guide. If your client wishes, we can provide and egress layout showing exact mounting locations. Please contact our Lighting Department and let us know how we can help. Free Lutron Maestro Dual Circuit Occupancy Sensor! Receive a free Lutron Maestro Dual Circuit Sensor when you complete a 5-minute online training module: Go to www.lutron.com/lcionline Register Log In Click on Web Based Training Click on Sensors Click on the OVW 113 - Maestro® In-Wall Sensors Overview Module. Once complete, Lutron will mail you a sensor. White only and while supplies last. Sign up today for a free lighting workshop for Trade Allies participating in the Focus on Energy programs. Learn how to increase project scope by using a comprehensive lighting approach. Learn about new products and technologies that make recommending a comprehensive lighting approach in retrofit applications more feasible. Network with lighting manufacturers and manufacturers' representatives and see their latest and greatest Focus on Energy eligible products. Familiarize yourself with current advanced control strategies that will help your projects achieve the next level of energy savings and customer satisfaction. Gain insight on how to better communicate highly technical project and financial information to your customers in a format that is easily understood. Sessions are free and include hearty breakfast and refreshments. Just announced: New super long life GE T8 lamps with extended warranties! The 28 watt T8 has an average rated life of up to 55,000 hours when used with an instant start ballast, and 84,000 hours when used with a programmed start ballast. The 25 watt T8 extends life to 70,000 hours on instant start and carries an 84,000 hour life on programmed start. When purchased as a system, the warranty on the 28 watt lamp is 48 months when paired with a GE UltraMax ballast, and 84 months when paired with an UltraStart series ballast. For the 25 watt, lamp warranty is 60 months on UltraMax and 84 months on UltraStart. In all cases, system warranty on the ballast is 5 years. Certain ballast model numbers are required to maintain the warranty length. Contact your Hein sales associate today to learn more. Still not convinced that LED lighting is poised for a nationwide takeover? 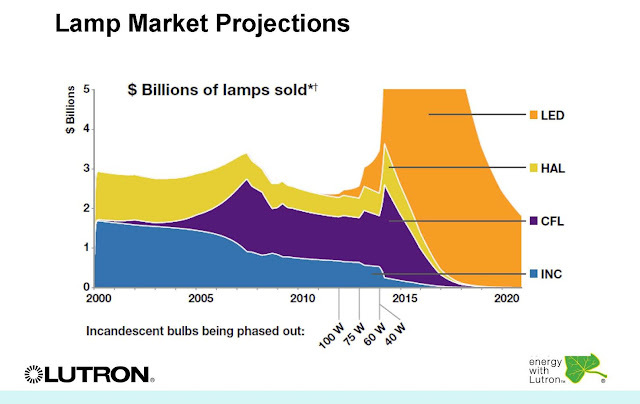 This slide from Lutron Electronics shows the projected sales graph for LED, halogen, CFL, and incandescent lamps through the year 2020. As you can see, it won't be long until the light sources that we've long been familiar with begin to fade from the mainstream, leaving LED as the dominant choice for illumination. As Americans use less and less energy, taxes will be spread over a smaller amount of kilowatt hours, resulting in higher energy rates. Contact your friends at Hein Electric Supply to find out how they can help outfit your facility with the latest in LED energy saving technology. Recently the Consumer Product Safety Commission (CPSC) announced a recall by Philips of their Endura 12-watt and Ambient 12.5-watt LED dimmable light bulbs. This product is a Philips’ energy star lamp, one of their original designs that had a yellow-orange and grey exterior housing (image below). It was sold under the Endura LED brand in professional channel, and Ambient LED in consumer channel. Philips no longer makes this product but still sells it, with primary distribution channels like Home Depot & Amazon. This is the second recent recall of LED bulbs sold at Home Depot, as there was a recall of several “Ecosmart” branded lamps that were made by Lighting Science Group a few months ago. A lead wire in the bulb’s housing can have an improper fitting, which can electrify the entire lamp and pose a shock hazard. This recall involves Endura 12-watt and Ambient 12.5-watt LED dimmable light bulbs. 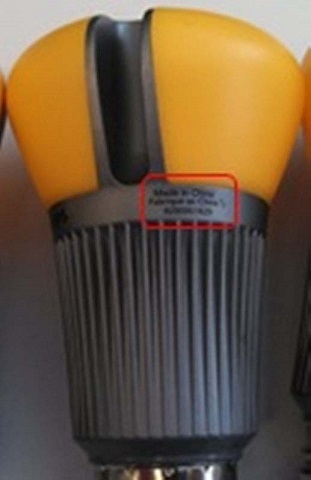 The bulbs are orange in color and have “MADE IN CHINA,” “Fabrique in Chine” followed by a slanted “S,” and the model number 9290001829 printed on the gray plastic band on the neck of the bulbs. The date codes, 2L for the Endura bulbs and 2K or 2L for the Ambient bulbs, are printed on the metal screw base. The bulbs give off a white light and are used indoors to replace incandescent bulbs. Consumers should immediately stop using the recalled LED bulbs, unplug the fixture, remove the bulb and contact Philips for free replacement bulbs. Sold at Home Depot, grocery and home center stores nationwide, online retailers, including Amazon.com and through electrical distributors between October 2012 and May 2013 for between $15 and $30. Hein Electric Supply stocks a veriety of LED lamps from GE and Satco. Stop in to your nearest Hein Service Center today. We are offering 3 breakout seminars during the trade show. 1. ASHRAE 90.1/2010 Energy Code Update presented by Wattstopper. 2. LED Lamp Technology and Compatibility presented by GE Lighting. 3. RAB Lighting Continuing Education Credits Course (2 CEUs) presented by Schwind-Lawless Sales. Space is limited. Please fill out the sign up form and fax it back to 262.790.5555 by Thursday, September 5th. automatic shutoff of indoor and outdoor lighting when not in use. automatic lighting shutoff now required in buildings <5,000 sq.ft. unless specifically exempted. occupancy sensors required for a broader range of applications. manual-ON or auto-ON to 50% operation required for automatic controls. automatic multilevel lighting in certain stairwell, parking garage and other spaces. For more information on ASHRAE 90.1/2010 you may visit this website. Please contact your sales representative or a member of our Lighting Department at 262.790.8400 for more information. Also please visit www.hein.com. 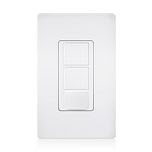 The Lutron Maestro Occupancy Sensing Switch is a practical switch for either residential or commercial properties. 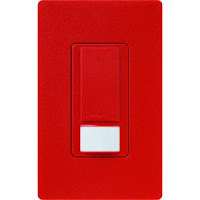 Perfect for bathrooms, basements, pantries, laundry rooms or kid’s rooms this switch is just right for your home. This occupancy sensing switch is also a great option to choose when designing offices, storage rooms or mechanical rooms. The passive infrared sensors that are embedded in this switch are able to automatically control the lights in an area by detecting heat from those within that area. This three way standard toggle switch also has a built in daylight sensor! This product is available in a number of gloss finishes and satin finishes. The MS-OPS2 is a 2amp switch whereas the MS-OPS5M has 5amps. We are pleased to introduce Lutron’s Maestro Dual-Circuit Occupancy Sensing Switch! This switch has all the same capabilities as the general Maestro Occupancy Sensing Switch with the simple difference of being a dual circuit. The Dual-Circuit switch combines two switches with an in-wall, passive infrared (PIR) occupancy or partial-on sensor. The creation of this switch was projected for either control of two circuits or Bi-Level control of two circuits, as required by certain energy codes. Bonus Offers exclusively from Focus on Energy! Take advantage of these special limited-time Focus on Energy offerings especially designed for mid-sized industrial/service facilities. You can improve the quality of your workspace and reduce production costs for years to come. For a limited time, Focus on Energy is offering a 50% bonus on the standard incentive for the installation of high performance T8, reduced wattage fixture or LED lighting options for industrial and service facility office and task lighting applications (no high bay or general plant lighting accepted). The special offering incentive is capped at $250 per location. Double the incentive for compressed air leak survey and repairs on systems with 60 HP or less when an additional compressed air efficiency project is implemented. Receive $0.65/cfm of make-up air eliminated by installing a filtration system. Submit the Special Offering Application to get your reservation code and guarantee your incentive. Please click here for more details and important deadlines for these money saving offers! Since the inception of the lighting department, our goal has always been to be of benefit to our customers. Whether it is a quotation, a design, project management, or simply knowledgeable experts that can help keep you up with the times, we are here to lend a hand. By now, you are all aware that LED lighting has found its way into wall packs, floods, area lights and screw-in lamps. We can also add 2x2, 2x4, wrap fixtures, and hi bays to that list. However, today there is still no standardization for LED lighting. Simply put, LED lighting is still the Wild Wild West. Trying to disseminate all of this technology can be confusing, and we want you to know we are here to help. Any time you see the Green Light button in other marketing formats, click it and you will be redirected to the Green Light Blog. Here you will find information about lighting technology, new products, updated lighting incentive information, and more industry-related information. It will be updated as often as possible.